1. Preheat the oven to 190°C, gas mark 5. 2. Halve the fennel bulbs and cut each half lengthways into 2-2.5cm-thick wedges, keeping them intact at the base. 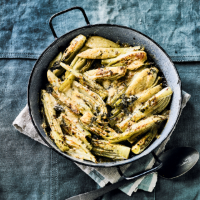 Toss in a large bowl with the olive oil, garlic, fennel seeds, chilli, flakes, reserved fennel fronds and seasoning. Put into a large gratin dish and cover tightly with foil. 3. Roast for about 20 minutes – the undersides should be pale gold, then remove the foil, sprinkle on the cheese and put back in the oven for another 10-15 minutes, or until the fennel is tender and the top is golden.